These days it seems rare to come across a new recording of something from the Baroque era which doesn’t fall under descriptive terms which include the words lively, crisp or transparent. This being a live recording, the term ‘lively’ is almost a literal one, and there is plenty of animation in the playing throughout. Indeed, the tempi at times seem so swift as to be headed for disaster, though everything is almost invariably held together with spectacular virtuosity. 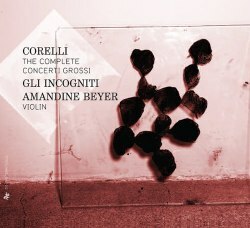 Gli Incogniti has a compact sound, but is quite a sizeable group with a listing of 18 players in the booklet, corresponding to the core of musicians which are known to have been connected with Corelli, as Amandine Beyer states in the booklet, “deploying the golden splendours of the harmony with all the power born of total commitment.” The sound has a sparkling quality through a wealth of harpsichord notes which might have been a bit too much of a good thing were it not that the instrument is, quite correctly, fairly low in the recorded balance - supporting rhythm and harmony while for the most part blending well with the strings. The recording venue, the remarkable Arsenal de Metz hall, is nice and airy without being overly swampy in terms of resonance. Amandine Beyer’s solo parts emerge from the ensemble as an equal partner rather than being in any way spot-lit, though the detail is easily sufficient to point out contrast between the concertino soloists and ripieno - the rest. Vibrato in the strings is held to a minimum in accepted authentic style, though the playing is by no means without expression - dynamics and drama more than carry Corelli’s musical messages, though the colour of the sound remains that fairly chilly silver throughout. There are numerous recordings of these works around, so where does Gli Incogniti find itself in the rankings? For my personal taste they easily replace the rather disappointing Cantilena and Adrian Shepherd on Chandos, also pipping Capella Istropolitana from Naxos, which does however offer a more beefy sounding alternative if you prefer a richer or warmer string sound from modern instruments - the springy vibrato from the soloists not however an advantage in these recordings. The Avison Ensemble on Linn is a real contender (see review) and on parity terms with this Zig-Zag release, being a bit more relaxed sounding without losing much in terms of verve and energy. What you will notice about Gli Incogniti’s set is that the concerti are not placed in numerical order, and in fact No. 1 appears as last on CD 2. This works very well in this context, with a decent mixture of pieces, the finale of disc one being the most famous ‘Christmas Concerto’ performed in classy style and with plenty of affecting tenderness and truly zippy fast movements. If you want to contrast in terms of zippiness, the opening bars of the first movement in this concerto cover about 9 seconds from Gli Incogniti compared to 16 seconds on Ensemble 415’s Harmonia Mundi recording, which has plenty of nice elements but in this case is about as far from vivace as you are likely to hear. Each time I picked out a movement in this set I met nice surprises. The opening of the Concerto da Chiesa No. 2 in F major for instance, the one which was such an inspiration to Tippett in his Corelli Fantasia,has nice diminuendi in the violin duet trills, which also have perfectly synchronised ritenuti. These are elements of real character which keep everything alive and filled with novelty, without becoming wearingly mannered. All in all this is the kind of release which can solve all your Corelli Op. 6 problems in one go, and I for one don’t feel the need to seek much further to have the best from this music. As far as being ‘live’, there are few if any detectable extraneous noises to interfere with your enjoyment, though with three dates of patch sessions owned up to I’m sure such any blemishes were rigorously excised. There is some applause at the end of both discs however, which seems a bit unnecessary but isn’t particularly sustained.